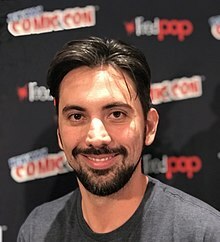 Jeremy Slater is an American writer and producer of film and television, known for his work on films such as Fantastic Four and Death Note, and on television series such as The Exorcist, which Slater created, and on which he served as executive producer. Slater wrote My Spy, an action comedy film which will be directed by Jake Kasdan, as well as Tape 4, a horror film to be produced by Primal Pictures, and Man of Tomorrow, a superhero noir film which was included in the 2012 Black List. In July 2012, Slater was hired to write the script for the 2015 Fantastic Four film. After the film was released in August 2015, Slater commented that a lot of what he wrote was not in the finished film (particularly his version of the first act), but that he'll "always be honored that [he] got to play in such a cool sandbox." Slater's original version of the script for Fantastic Four was said to feel more in tone to a Marvel Studios movie, being an action-packed superhero adventure in contrast to the final film's dark and realistic tone. It included the villains Galactus, who is the source for the titular characters' powers, Mole Man, and Doctor Doom as a Latverian dictator and herald to Galactus, in contrast to the antisocial programmer he was portrayed as in the finished film. Slater wrote a draft of the live-action American film adaptation of Takeshi Obata's manga series Death Note, which is directed by Adam Wingard. Slater is the creator and executive producer of The Exorcist, a TV drama based on the film with the same name. ^ a b "'Fantastic Four' Reboot Ramps Up with Writer Jeremy Slater (Exclusive)". The Hollywood Reporter. July 13, 2012. Retrieved August 22, 2015. ^ Wakeman, Gregory (August 14, 2015). "Fantastic Four Writer Admits Most Of What He Wrote Isn't In Finished Film". Cinema Blend. Retrieved August 22, 2015. ^ Chitwood, Adam (August 19, 2015). "Original 'Fantastic Four' Script Included Galactus, Mole Man, and Much More Action". Collider. Retrieved August 22, 2015. ^ Kit, Borys (April 27, 2015). "'Guest' Director Adam Wingard Signs On for 'Death Note' (Exclusive)". The Hollywood Reporter. ^ Ryan, Maureen (November 4, 2016). "'The Exorcist' Executive Producer on Creating Smart Scares for the Modern TV Viewer, Future Seasons". Variety.